It is probably the first question that comes to your mind everytime you hear the phrase ‘hair oiling’. In general – it is simply applying natural oils to hair and scalp. Make sure that the oil you use is unrefined and cold-pressed – only then it is suitable not only for eating or cooking but also as a beauty product. What is more, it does not loose its valuable properties, vitamins and minerals. Application of hair oils is similar to using hair balms and masks. first of all: the type of the preparations you apply (instead of a hair mask bought in a drugstore you use oils). 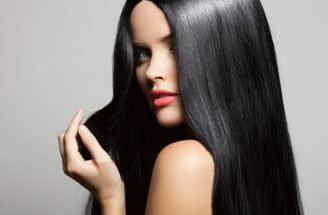 secondly, hair masks work only on the hair shaft while hair oil has beneficial influence on hair, scalp and hair bulbs. Remember that it is very important to apply oils to your scalp. How to perform hair oiling? WHAT IS NECESSARY FOR HAIR OILING? 2. A plastic shower cap. This gadget is also useful if you plan to leave the oil in overnight. It will also secure your pillow from staining. 3. A special brush (for example the one used for hair-colouring) or any brush you consider handy. It will facilitate the application of oil on the scalp and hair. Thanks to it, you will evenly spread oil all over hair. Do it as if you were to dye your outgrowths: simply art your hair in different parts of your head and apply oils there. When the entire scalp is covered with oil, apply it to hair along the entire length and then perform a gentle head massage to stimulate circulation and “force” hair follicles to work. 4. A wide-tooth comb – it will facilitate brushing hair covered with oil and will also massage the scalp. 5. A gentle shampoo. This is what will wash off oil from your hair. Ideally, if it is natural, free of heavy silicones, parabens and other comedogenic substances. This shampoo does not interfere with processes taking place on the scalp. You might as well use a gentle baby shampoo. There are various hair oiling methods, each of which will work with a different intensity on your strands. It is worth knowing them all, just to try how they work on your type of hair. Probably the best idea is to use several methods alternately to ensure comprehensive protection and hair regeneration. Remember however, that your hair oiling schedule the must include oiling of the scalp – only this way you will provide total regeneration of hair and strengthen the roots. 1. OVERNIGHT HAIR OILING – apply oil to dry or damp hair and scalp (it is very important!). Leave it in overnight and wash it off in the morning with a gentle shampoo. 2. HAIR OILING BEFORE WASHING – is a short version of overnight oiling. If you do not have the time to wash your hair in the morning, simply leave oil in for a shorter period of time. However, keep in mind that an hour of treatment is the absolute minimum amount of time required for oils to work. Then, you can wash your hair using a mild shampoo. 3. HAIR OILING WITH A CONDITIONER – Add a few drops of oil to your conditioner or hair mask. It is better if you use products without the content of SLS, SLES. Always look for natural ingredients. 4. HAIR OILING IN A BOWL – resembles a method well-known to our grandmothers – soaking hair in herbal infusions. In this case, apply a few drops of oil into a bowl filled with water (or milk, aloe vera juice, herbal brew etc.) and soak your hair in it right before or after washing your hair. 5. HAIR OILING WITH A MIST – consist in spraying your hair with a mixture of oils, water and herbs (it can be just boiled water and oil). Pour the blend into a bottle with an atomiser and spray all over your hair. You can use it whenever you want to add shine, improve condition or moisturise your wisps. 6. 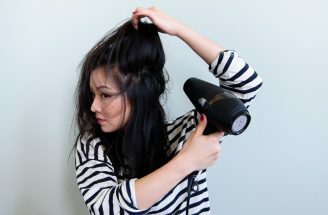 DRY HAIR OILING – in this case you apply oil to dry hair after washing and blow-drying. Make sure to to avoid applying it to the scalp. This way you will provide shine, nourish and protect your strands from harmful UV radiation. Additionally, you can apply oil from the mid-lengths downwards or only to the ends – this will help to prevent from splitting. What is more, remember that when using natural oils, regularity is very important. It is the key to success, it allows hair to grow properly, provides thorough regeneration and beautiful appearance.